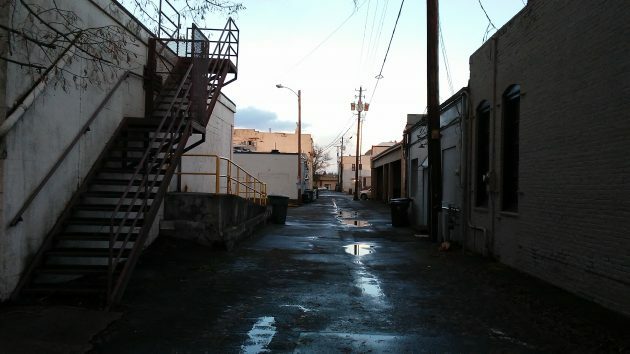 Improving back alleys is not part of Albany’s downtown plan, but lots of other things are and remain undone. Enough about the weather! Let’s consider, instead, Albany’s urban renewal effort, which has been inching along ever so slowly for years and, despite considerable achievements so far, remains far from reaching its stated goals. When the downtown urban renewal district was formed in 2001 to revive the dormant and decaying city center, the goal was pretty clear. The Central Albany Revitalization District was supposed to undertake about 50 projects or activities to increase the district’s economic value. To accomplish these things, it would need a pile of money, then estimated to be $35 million in 2002-2003 dollars, or $56 million by the time all the projects were done. It was supposed to borrow the money and pay it back from tax revenue on increased value, revenue being withheld from other taxing districts. According to the original schedule, all this was supposed to be finished by the tax year 2026-27. In case you didn’t notice, that’s a mere 10 years from now. The district has been in existence for 16 years and is supposed to have only 10 years to go. It should be more than halfway done. The ending date is important because that’s when taxing districts start getting a return on all the tax revenue they give up while the district exists. For the City of Albany, the total tax forgone over the district’s life was estimated at $22 million. Linn County was going to give up $11 million, the Albany schools nearly $16 million and LBCC almost $2 million. You can bet that those taxing districts would like to start getting some of their investment back sooner rather than later. But the ending date now looks like a mirage, always retreating into the distance. At the end of fiscal 2015, of its maximum $56 million borrowing authority, CARA still had nearly $38 million left. This year, CARA is borrowing about $8 million to launch a big “streetscape” improvement project on six downtown streets. The idea is that this will encourage business development, job creation and private investment along those streets. One can only hope that the premise is borne out. Other than the street work, nothing big is on the schedule, apparently. CARA’s advisory board, which includes the city council, meets monthly. The sessions are not usually marked by any sense of urgency or drive. I can’t remember anybody saying, “Hey, we only have so much time. Let’s start something big and then get it done before all the glaciers melt.” And this month, apparently with nothing to do, the meeting was called off. CARA has been controversial, which partly accounts for the board’s slow approach. But it can claim results: $70 million in private money invested since the program began; or about $7.30 invested downtown for every dollar that CARA has spent or lent. When CARA began, the district was valued at nearly $250 million. In 2015, the value had increased by about $140 million. The goal, according to the city’s published material, is an increase of $230 million. Nobody knows whether new sidewalks and trees will help get it there. Let’s hope the new streetscape will help fill these empty retail spaces on Third Avenue. All of the Albany City Council urgency normally reserved for CARA-related projects has seemed subdued of late. It’s not their money, so what’s the hurry. The CARA-sell is the phrase which comes to mind. Anywho…the Council’s ability to make development decisions will likely improve in 2017. As you have reported on several times, the Albany Council has been distracted since 2014 when the electorate had the audacity to legalize recreational cannabis. The council members have been in a tizzy until just this month when they eventually bowed to the will of the people. However, now that the Council has crossed that Rubicon, we can expect to see a reinvigorated interest in all things CARA. Perhaps now might be the time for some entrepreneurial person to approach CARA seeking tax dollar financing for a downtown Cannabis Bar. 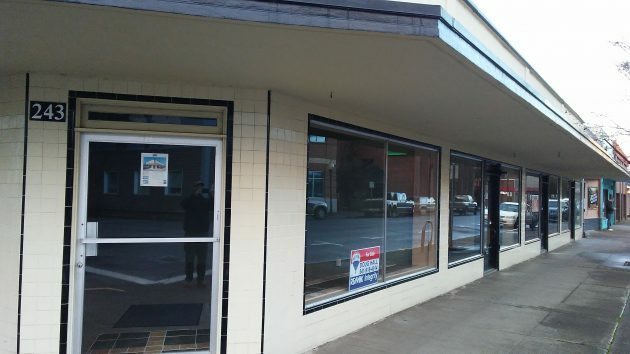 As shown in one of your pictures, there are lots of vacant buildings downtown. A lot of these vacancies have occurred since CARA was formed. Are they the result of the higher taxes in the CARA district? Have the owners had to raise rents so high they’re no longer affordable? Is that why there are so many for sale now? We would be better off if CARA payed off it’s existing loans and closed it’s doors. The “money invested” would then slowly return to the folks to spend as they saw fit rather than having a bunch of bureaucrats throwing money around nilly willy. Few things are as destructive to an economy as government. Damage from hurricanes is much easier to untangle than well meaning bureaucrats. Earthquakes take time to recover from. While government goes on and on destroying all in it’s path. But hey, it’s not their money, so why not spend it, right? That depends on how you look at it Hasso. The amount of taxes in the CARA district are higher now because of tax reassessment on “improved” properties. When you build a huge brick building and it’s assessed at millions, the value of properties around it are falsely inflated and people pay more in taxes. Which means that a dilapidated building, that has had no repair, will pay more in taxes. Hence, taxes rise. Ahhh, didn’t the voters limit what CARA can do??? Didn’t Tom terrific push through a measure which stopped CARA projects? And if I remember right, you were part of the push….correct? So why do is the City being chastised now?? Can it be shown with data that giving millions of siphoned public dollars to private businesses alleviates disease and crime? Does replacing perfectly functioning sidewalks, lighting, and signs eliminate a menace to our morals and welfare? Of course not. Through many of its spending actions CARA has rendered “blight” a useless concept. When any condition can be labelled “blight” it is impossible to distinguish between worthy and unworthy projects. Several years ago Albany citizens declared that the city council must do what they didn’t do with CARA – get voter permission for every future urban renewal plan. As a result, CARA will never rid itself of the stink of illegitimacy. I have stated more than once that, as a body, we have sorely lacked the political will to do the bigger projects as outlined. We get mired in “paralysis by analysis.” On a brighter side, as you have noted, “This year, CARA is borrowing about $8 million to launch a big “streetscape” improvement project on six downtown streets.” Very-very long overdue! I can only hope it is but a new start of our “engine” of working our plan. It’s not really homework until it’s due in the morning. Having said that, a multi-year plan is not graved in stone. Unforeseen events (like a major recession and loss of manufacturing jobs) prompt mid-course corrections. At this point, the questions is whether the program has produced results. Apparently it has. Exactly, doesn’t take much more than common sense to see the recession played a huge role in the slow down. All these Monday morning quarterbacks that can do things so much better. So get off the keyboard and get out and do it. The main purposes of any bureaucratic government institution are to raise money,consolidate power in themselves, and perpetuate their existence. How can you say CARA has not met its goals? Makes me want to search the series of tubes we call the internet for that long CARA list of “to dos”. We should all help to select 5-7 to FAST TRACK. Now’s the time to add it!